I first made this recipe for Moroccan Chicken in 1998, just months after I graduated from culinary school. I still make it—with some modifications—from the battered copy of the August 1998 issue of Saveur magazine, and my friends and clients still like it just as much. The secret to this dish is in the braising of bone-in, skin-on chicken, which makes the chicken moist and falling-off-the-bone tender. Make sure to allow enough time to marinate the meat. I have even marinated it over night, in the refrigerator. Note: I recently made this for a dinner party where one of the guests of honor didn’t like olives, so I didn’t include them in the cooking process but instead served them on the side of the dish. 1. Crush garlic on a cutting board with flat side of a chef’s knife. Sprinkle with about 2 teaspoons of salt, then finely chop garlic and crush again to forlm a smooth paste. Combine garlic paste, parsley, ciulantro, cumin, ginger, saffron, and pepper in a large bowl. Add chicken quarters, stirring well to coat with herbs and spices. Cover bowl and set aside to marinate for 1 hour at room temperature, or for 4 hours in the refrigerator. 2. Place chicken quarters in a large, heavy-bottomed casserole skin side down. (I use both my Calphalon paella pan and my cast iron skillet since I have lids for both.) Add onions and 2 cups water. Bring to a boil over medium-high heat, then reduce heat to medium-low, cover, and simmer gently for 30 minutes, stirring occasionally to keep chicken moist. 3. Check the level of liquid in the pan(s) and add more water to maintain a minimum of an inch in the bottom of the pan. Cook for another 20 minutes or until chicken is tender and thigh meat comes away from bone. 4. Add olives and lemon pieces to casserole and cook, uncovered, for another 10 minutes. 5. 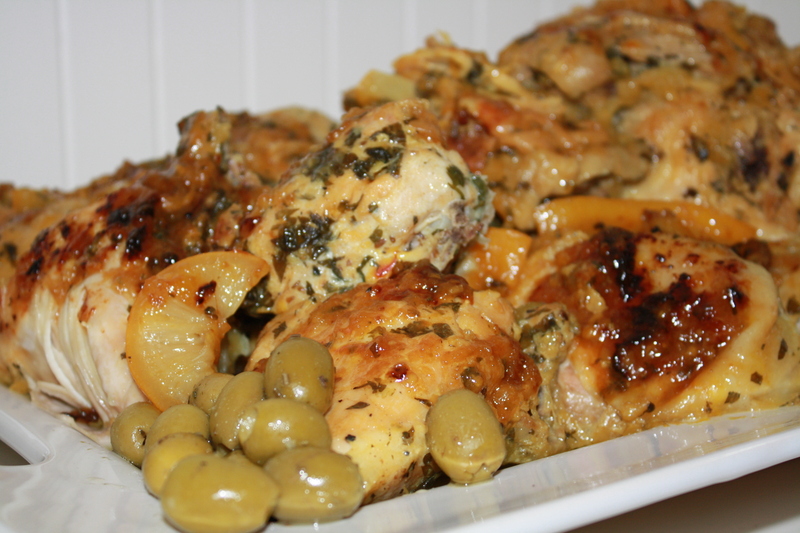 Remove chicken, olives, and lemon pieces from casserole with a slotted spoon and place on a platter; set aside, cover, and keep warm. Bring pan juices to a high boil and cook until a very thick sauce forms, about 15 minutes. Spoon sauce over chicken and serve. Tip: Preserved lemons are sold in brine, usually in glass jars. Look for them near the olive bar or in the grocery aisle with artichoke hearts and pickled vegetables. This entry was posted in Poultry, Recipes and tagged Chicken, Dinner. Bookmark the permalink.